Flickr has said that despite the increasing number of users uploading images from mobile phones, the number of DSLR users is still increasing on the popular image sharing network. Speaking to exclusively TechRadar, Markus Spiering, head of product for Flickr, said, "We are still in a DSLR market, it is rising. People still use DSLRs and contribute a large portion of images to Flickr." Although the iPhone 4 remains the most popular camera on Flickr (based on stats from the past 30 days), the rest of the top 5 is made up of DSLRs, with the Canon EOS 5D Mark II being the most used. "What we're clearly seeing is that mobile photography, especially from the iPhone and Android ['phones] is sky-rocketing, but it doesn't affect DSLR images. It does affect the point-and-shoot cameras however." Recently, use of a Canon DSLR did briefly overtake the iPhone 4 on Flickr, but Spiering says this is due to an increasing number of people now using the iPhone 4S. "Use of the iPhone 4S is also sky-rocketing, so it's more of a split between iPhone 4 and 4S users, which is the only reason the Canon was able to take over." One of the most interesting trends Flickr sees is the times that images are uploaded. "On Sunday night and Monday we have a huge volume of photos being uploaded from non-mobile cameras, so from DSLRs and point-and-shoot. "I think this is when people have been out on the weekend and they come back to work to use the fast internet connection to share photos. "Throughout the rest of the week, the upload numbers for non-mobile cameras is much lower, while for mobiles it remains high, showing us that the tendency is to upload straight away, rather than waiting to be back at a PC." 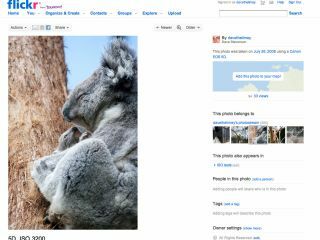 Flickr is currently working on a redesign that will start to be rolled out on Tuesday and will see a number of changes in the upcoming year.